Hello! This is Sukie and today I have a project to share focusing on "mom life". I think it is extremely important to focus on the positive in my life. Being a working mom with tons of daily obligations, I like to take the time to focus on the best part of my day. One of the ways to do this is to keep a gratitude journal and with Thanksgiving right around the corner I thought it was the perfect time to create one. My project started with a simple journal I had in my stash and I selected some fall papers from the DCWV Autumn Leaves stack for the cover. 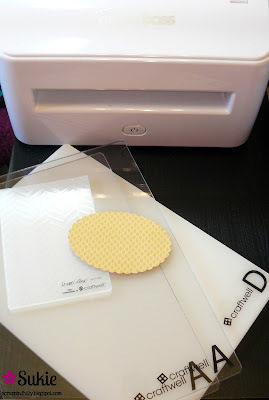 I used my electronic cutting machine to cut out some leaves, the "grateful" title and a scalloped circle. The Teresa Collins Herringbone embossing folder was used to emboss the scalloped circle for some added texture. A strip of coordinating washi tape and some tulle were the perfect embellishments for the cover. Once the cover was finished, I decided to cut a few decorative elements to add to some of the pages. 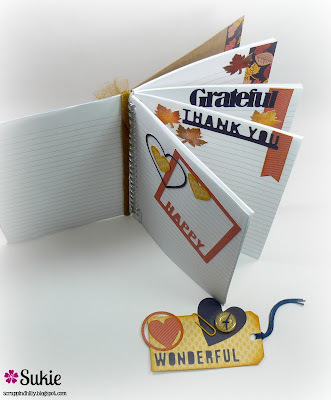 The die cut pieces are from the Teresa Collins Thankful Pocket Dies, they were absolutely perfect for my journal. 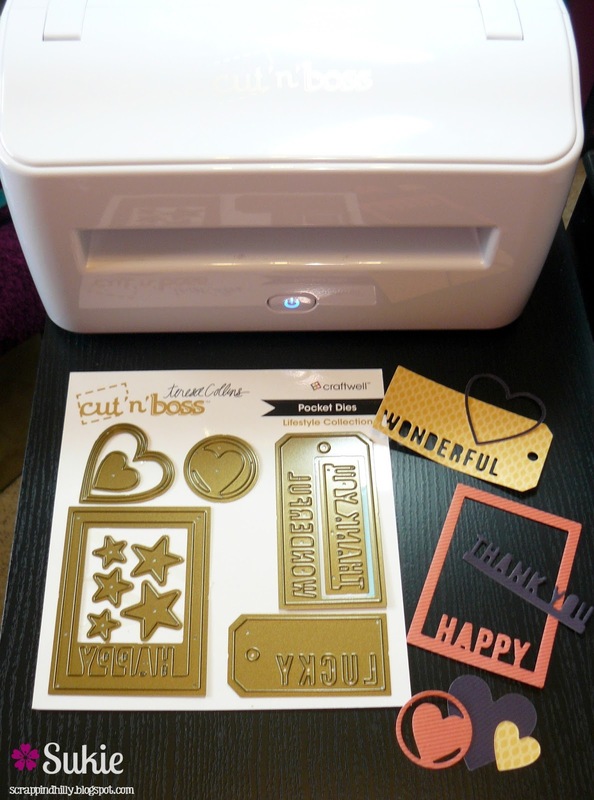 All of the die cuts were transformed with my eBrush which adds so much depth and dimension. 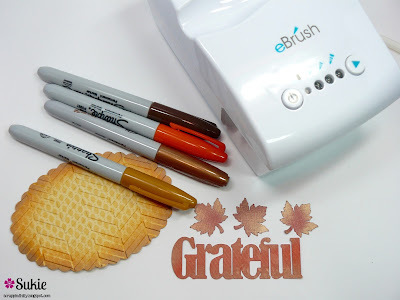 The eBrushed leaves are so colorful and unique based upon the color of the Sharpie pens used on each leaf. I added a few leaves to the inside of my journal too. I plan to use the tag as a bookmark so I embellished it with a matching paper clip, button and some Totally Navy Trendy Twine. The die cuts were adhered to a few pages leaving most of them free for journaling. I think this will be a fun way not only to document the positive in my life but also to have the family contribute during the Thanksgiving holiday. The journal can be a great tool for memory keeping and even adding pictures. The little kids in the family can even draw pictures. The finished journal would make such a great gift for the grandparents. Love the journal cover and all the texture you added with color and embossing, Sukie! Wow, Sukie! You really did an amazing job on your journal! I love the papers and the die cuts you used. Simply wonderful.